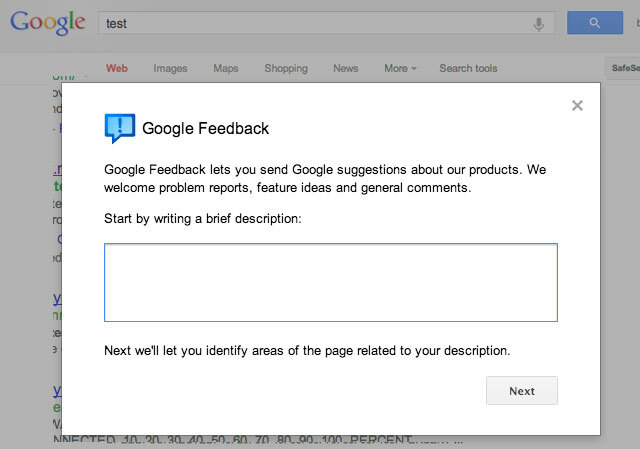 Google has quietly updated the feedback form found at the bottom of every search results page. When you conduct a search on Google, at the bottom there is a link to "Send feedback." When you click on that, it use to take you off the search results page to a form page to give Google feedback on that search. This new user interface for the form looks a lot simpler and cleaner. It also aids in helping the searcher that is sending the feedback in remembering what the search results looked like while he/she sends the feedback. The feedback form is simpler now. Before they used to have an overlay of the web page that allowed you to mark what part of the page you didn't like. Now it's just a simple input box where you can enter your feedback. There was a time they were asking for your gmail account, too. Glad that's gone. The overlay blew up on me and prevented me from giving feedback about the SERPs. Glad that's gone, too. This new version is best, it's uncharacteristically simple and easy to use for a Google tool.